There is an hamlet longging to Tarington toun not a mile by est from Tarington coullid S. Gilys, wher George Rolles hath buildid a right fair house of bryke. Stevenston was the lands of Richard St. Michael, in the time of king Henry the second, who granted the same unto Richard Basset, whose son, Elias Basset, in king Henry the third's time, passed the same to Walter de la Ley, who of the place took to name Stevenston; and, in the thirteenth of king Edward the third, Elias Basset; lord of Beaupier, in Wales, released all his right therein to John de Stevenston. After three descents in that name, the last had issue Elizabeth, married to William Grant, of Westleigh, one of whose co-heirs matched in the family of Monk, another with Moyle, who had this land for his part, which was the dwelling of sir Walter Moyle, in king Henry the sixth's reign. Afterwards, this barton came to be the inheritance of George Rolle, esq. and hath ever since been the dwelling of the Rolles, knights, where they have their warren for conies, and their park for deer. The now inheritor of a great estate married Margaret, the daughter of the lord Pawlet, of Heanton-St -George; his father, Anne, the co-heir of sir Thomas Dennis, knight; his grandsire, the daughter and heir of Watts; and secondly, the daughter of Fortescue, of Vallopit. When George Rolle died in 1552 the estate passed to his son, John Rolle, who died in 1570. A monumental brass to John Rolle's wife, Margaret Ford, is located inside the church. Their son, Sir Henry Rolle, held the estate until his death in 1625. Stevenstone then passed to Henry Rolle's grandson, Denys Rolle (1614-1638). Denys Rolle has previously inherted the manor of Bicton, Devon from his father, Sir Henry Rolle (? -1617), who had acquired the estate upon his marriage to Anne Denys. Denys Rolle's infant son, John Rolle (1638-1642) inherted both Bicton and Stevenstone. Next to inherit was Henry Rolle of Beam, Weare Giffard (1605-1647), a cousin of Denys Rolle's father. 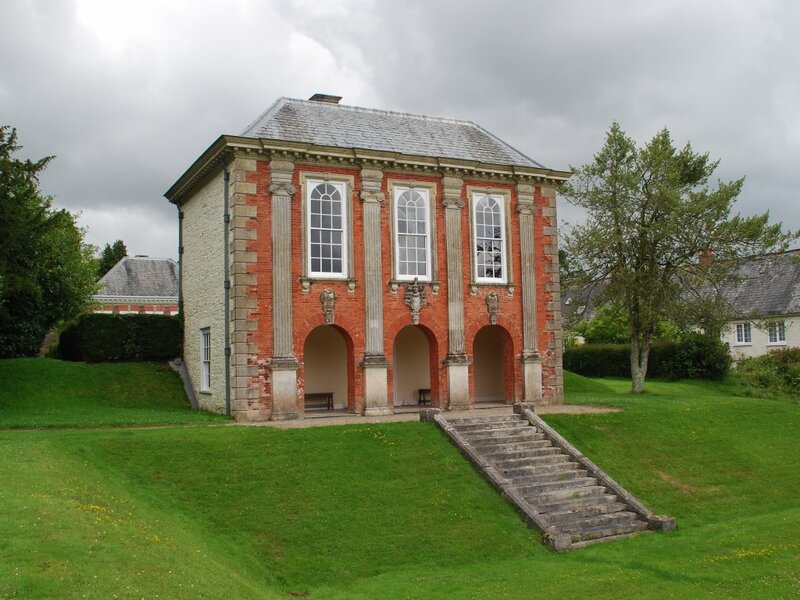 When Henry Rolle died in 1647 the manors of Stevenstone and Bicton were acquired by Sir John Rolle (1627-1706). John Rolle was the great-nephew of John Rolle (1518-1570) and had married Florence Rolle, the daughter of Denys Rolle. His descendants held Stevenstone until the death of John Rolle, Baron Rolle of Stevenstone (1750-1842). 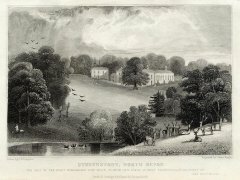 The estate then passed to the nephew of his second wife, Louisa Trefusis (1794-1885). Mark George Kerr Trefusis (1835-1907), the second son of Charles Rodolph Trefusis, 19th Baron Clinton (1791-1866), was required to change his name to Rolle as a condition of his uncle's will. Stevenstone, near Torrington, ... is a very old place, chiefly remarkable for very large trees, and for a boldly undulated surface. It is capable of immense improvement, in consequence of hollows that might be flooded with water, and eminences that require planting. The house is very old, though there is nothing worthy of notice in its architecture. It is low, occupying three sides of a long narrow court : the connecting side, or extreme end, containing the principal living-rooms ; one side terminating in the offices and stables, and the other in the family chapel. The library, as a protection from fire, forms a detached building in the garden. There is a peculiarly quiet and melancholy expression about this place, which we think we can trace to its having little or no appearance of being inhabited, to the prevalence of grass, and the absence of gravel walks, especially of winding ones, and to the park being, as far as we remember, totally without young trees. Well-kept gravel walks always give the idea of occupation ; and young trees, with their protecting fences round them, seem to show that improvements arc going on. 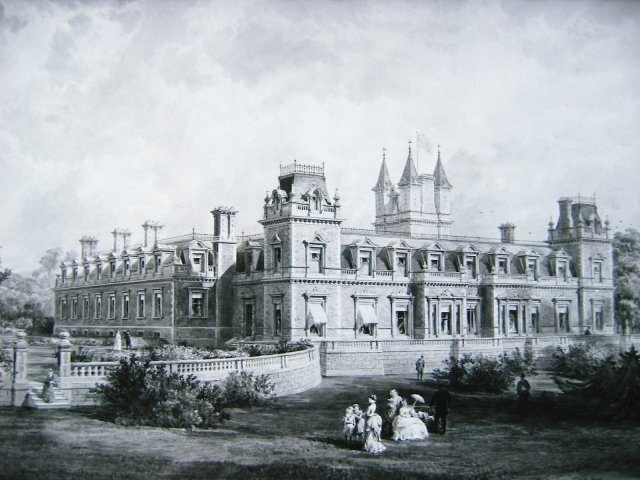 In 1868, Mark Rolle demolished most of the existing manor house and replaced it with a huge mansion of 27 bedrooms resembling a French chateau. Hoskins, in his Devon: A New Survey of England (1954) writes, "the richest man in Devon built himself the ugliest house." 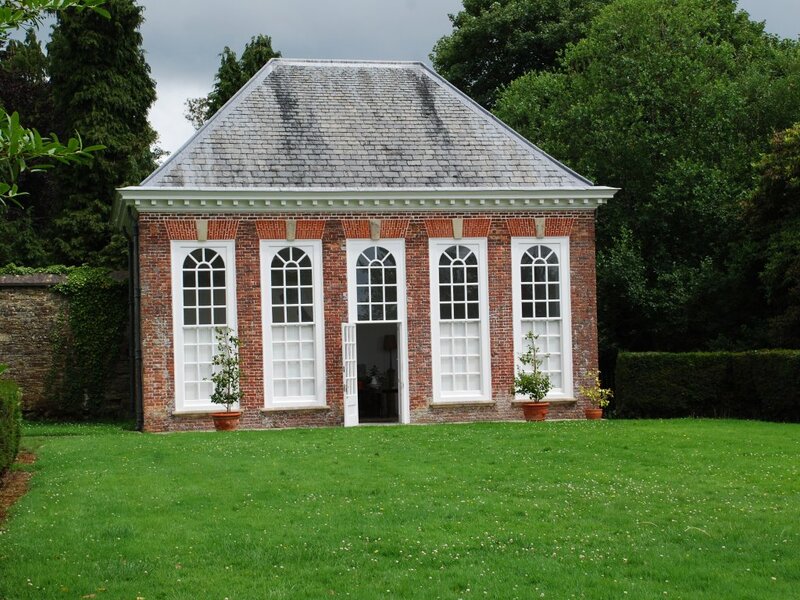 Two early 18th century outbuildings, the Library and the Orangery, survived the demolition and are now the property of the Landmark Trust. After Mark Rolle's death in 1907, Stevenstone became the property of his nephew, Charles Trefusis, 21st Baron Clinton, who sold it in 1912 to Captain John Oliver Clemson. Captain Clemson died at Gallipoli in 1915. Mrs. Clemson remarried and continued to live at Stevenstone, but in the early 1930s, after the death of her second husband, the estate was split up and sold off. However, no buyer could be found for the house. 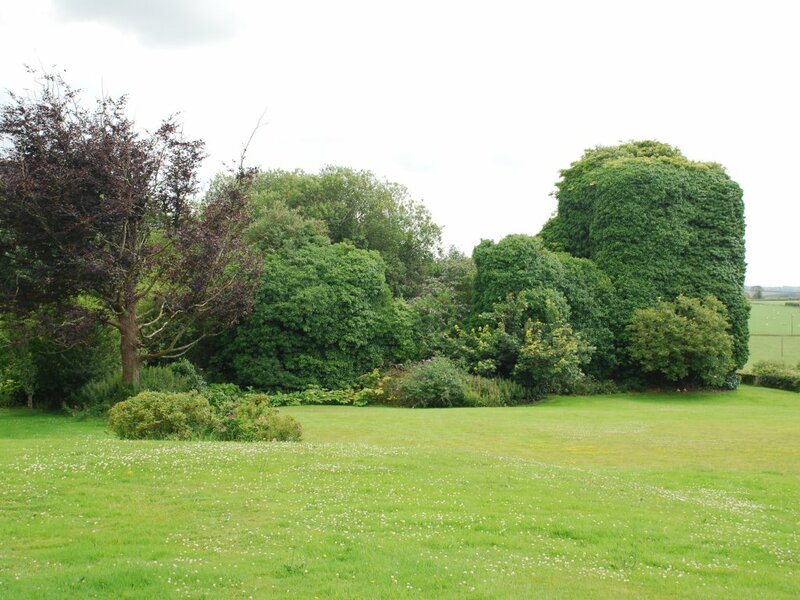 Briefly used to billet troops in World War II, Stevestone House was abandoned and soon decayed into an ivy covered ruin.